Posted on October 31, 2011	by Lou Murray, Ph.D.
I’ve made a bit of progress. I can write a draft on my iPad using the wordpress app, but can’t figure out how to upload it from there. I had to go to the bookmarked page for my blog to upload, not using the app. Shafts nuisance. This can’t be the way it’s supposed to work. I had visions of being able to take photos and blog while sitting in my nice little plot at the community garden. Today I’m going to try again to upload a photo from the iPad’s camera, ie the iPad’s library. Ah ha, I can success! (that was what the Japanese postdoctoral fellows in our lab said when their experiments worked. The phrase has gone into my vocabulary.) so here was the issue. The Internet connection simply wasn’t good enough. I was doing the right things, but the iPad wasn’t responding. 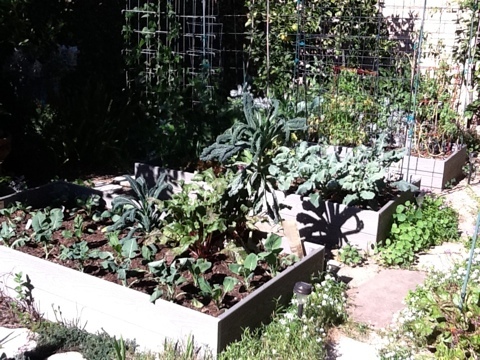 Anyway, the photo above is of my raised beds in the backyard, photographed yesterday. Next step, see if I can upload a video. That may be problematic given the file size. If it works, the video is a tour of my garden. Maybe I’ll start with a shorter one of my three chickens. Nope, didn’t work. Back to the drawing board. Well, it is Fowloween, I think a video of your chickens would be most appropriate 😉 Your garden raised beds look like they’re brimming with lovely winter greens! I think I will need access to wifi to upload videos from my iPad.